Toolshed: Who's the Nats' next phenom? Top Nationals prospect Victor Robles was nearly four months past his 20th birthday when he first got the call to Washington from Double-A Harrisburg in September 2017. 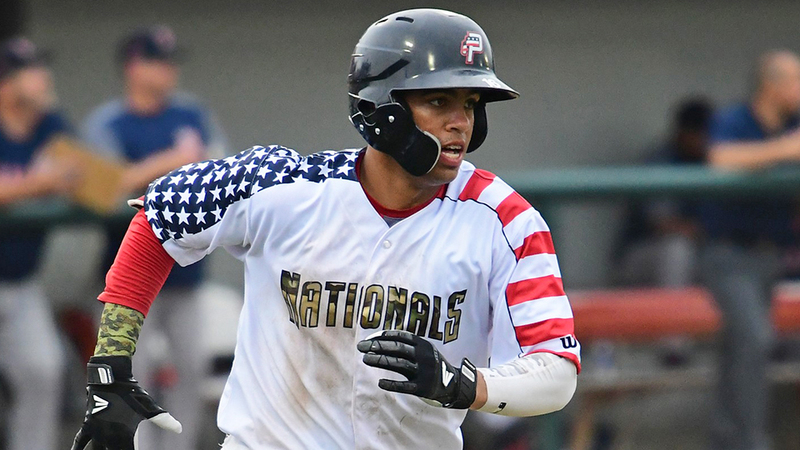 Juan Soto was famously only 19 when he was summoned to the nation's capital last May, again from the Eastern League. Even further back, Bryce Harper (remember him?) made his Major League debut six months shy of his 20th birthday in April 2012. If there's an organization that recognizes gifted prospects and pushes them aggressively toward the big leagues, it's the Washington Nationals. "It's a case-by-case basis on each player," said director of player development Mark Scialabba. "Usually we move players when we're certain they're going to continue to be challenged but also have success. You want to challenge them from a physical standpoint, but you want to make sure they're ready and don't have to go backward. It's a lot of conversation with our coaches and coordinators and obviously with [assistant general manager] Doug Harris and myself and [GM] Mike Rizzo. There's a big support staff. It's a collective effort." So with Robles expected to be the Opening Day center fielder alongside Soto in Philadelphia, a natural question is -- who's next? Who might be the next young Nationals prospect to surge through the system quickly? First, some parameters. We're looking for a player who makes the Majors earlier than expected and in a non-traditional way. This would rule out No. 25 overall prospect Carter Kieboom, who could help the Nats in 2019 at shortstop but is entering his fourth season with some Double-A experience already under his belt. Instead, we're looking for prospects who could head to Washington -- and make an immediate impact -- before turning 21 and/or with a maximum of two years of pro experience. Luis Garcia -- This is the obvious pick. The left-handed-hitting infielder was signed in July 2016 but already has seen Class A Advanced Potomac, finishing the 2018 season with 49 games there. He'll only turn 19 in May. The Nats pushed him to the Gulf Coast League in his first season, choosing not to keep him in the Dominican Republic, and he's responded by being incredibly consistent. These are his slash lines with three clubs over his two Minor League seasons: .302/.330/.387, .297/.335/.402, .299/.338/.412. In fact, there's been some growth, especially in the slugging department. "He has a hitting gene," Scialabba said of MLB.com's No. 75 overall prospect. "He's someone who knows how to barrel the ball and does everything he can to hit line drives. It's what he works on. I think he adjusts really well in an at-bat. He goes to a two-strike approach, which I don't think a lot of players necessarily do, but he has his own way of doing it -- sometimes taking it to the extreme by spreading out, choking up, doing things we've preached. He's very confident in his ability, doesn't let any negativity creep into his mind." More power could be coming, the Nationals believe, as Garcia continues to fill out his six-foot, 190-pound frame and matures physically beyond his 19th birthday. Where he plays if and when he reaches the Majors remains a question. Garcia has above-average quickness and a good arm at shortstop, and the Nats would like to see him at the premium position as long as possible. But with a crowded shortstop depth chart in the Minors, they also gave him time at second base and third last season. With Trea Turner holding down short and Kieboom getting groomed for second, Garcia's future may be the hot corner with Anthony Rendon eligible for free agency after this season. That's putting the cart before the horse, but team staff got a good look at Garcia during a 15-game Grapefruit League stint this spring. "He came into camp this year and really impressed a lot of people with his inability to be afraid and how he's gone left-on-left and taking the ball to left-center," Scialabba said. "That's what he does." Israel Pineda -- There's a lot more involved in developing those who don the tools of ignorance. Not only do catchers have to show they're ready with the bat and glove, but they also have to show they can work well with a pitching staff. That takes time. But Pineda, their No. 8 prospect, is a backstop that the Nats have moved fairly aggressively so far. Also signed in July 2016, the Venezuela native -- who turns 19 on April 3 -- played stateside in his first two seasons, getting time in the GCL in 2017 and Class A Short Season Auburn for the duration of 2018. He was a New York-Penn League All-Star and finished with a .273/.341/.388 line and four homers in 46 games. His offensive promise is more enticing at this point than his defensive work, though he has received above-average grades for his arm and backed that up by throwing out 40.6 percent of attempted basestealers. It's not without precedent that catchers can move quickly, if they're talented enough. The Dodgers' Keibert Ruiz, for instance, is on the cusp of the Majors, despite not turning 21 until July. Pineda has a long way to go before he can be comped to Ruiz, but the Nats are hopeful he'll be a big-league catcher given the way he's handled his road thus far. "He's got a very powerful swing for an 18-year-old," Scialabba said. "He can generate some raw power, especially to the pullside now, but he can also go middle-away. He has the ingredients to be a frontline catcher. You feed him information slowly. There is a transition to the States. There's the language barrier, which he's worked hard on. He understands how hard this game is. … Coming over here, he's continuing to improve with everything defensively. He was very raw when he came over here, very young at a very difficult position to develop. You have to take time and be patient. The bat's pushing him, but he has the work ethic and the aptitude to take to the coaching and the instructing, and I think he'll be more familiar with more repetition." Jeremy De La Rosa -- At Spring Training camp last year, Scialabba identified Garcia and now-No. 7 prospect Yasel Antuna as breakout candidates heading into 2018. (Antuna struggled early but showed promise before undergoing Tommy John surgery in August.) Who did he pick out this time around? De La Rosa is first on the position-player list. Washington signed the left-handed-hitting outfielder last July for only $300,000 out of the Dominican Republic. However, the organization quickly let him participate in the instructional league in the autumn and brought him stateside again for his first Spring Training. The scouting report has already jumped out. "He takes a good at-bat, has a repeatable swing with body strength and good hands," Scialabba said. "He has a very quick bat." De La Rosa also has above-average speed that could keep him in center field for a while. (His below-average arm, however, could portend a move to left field.) De La Rosa seems likely to follow the Garcia/Pineda model of seeing the Gulf Coast League for his first full summer, meaning this might be a pick to pop in 2020 more than 2019. But for such a low signing to already have people talking in Washington camp, the Nats could have another Robles or Soto on the grass here. Joan Adon -- Turning over to pitchers, Adon was among the other firsts that Scialabba mentioned among spring standouts. The 20-year-old right-hander already is a reliever, and that's usually not a great sign for a prospect that hasn't played for a full-season affiliate yet. However, his stuff has stood out enough to place him at the No. 22 spot in MLB.com's rankings of Nats prospects, and he's continued to impress this spring. "Joan Adon came on in the second half last year and in instructional league," Scialabba said. "He's got a fastball around 94, 95, 96, and he's still a very young, strong pitcher who will continue to grow, I think. He has a plus slider at times. It's late and sharp and hard. He's been impressive." The 6-foot-2 hurler struck out 40 batters in 30 2/3 innings last season between the GCL and Auburn, but he'll need to improve his 14 percent walk rate if he's going to get the most out of that fastball-slider mix. If he does, that could add a lot of fuel to his surge up the chain. Gage Canning -- Canning will turn 22 on April 23, making him a little old for this list. In terms of pro ball experience, though, he's right in line. The left-handed-hitting outfielder broke out as a junior at Arizona State, hitting .369/.426/.648 with 37 extra-base hits in 55 games. That prompted Washington to take him in the fifth round, and he'll enter his first full season as the club's No. 10 prospect after hitting .253/.319/.470 with six homers in 45 games between Auburn and Class A Hagerstown. His run tool is his only plus tool at present, but if he can continue to progress with the bat as he did with the Sun Devils, he could be on the fast track. Some added power would do him the most good. Even as things stand, he's the second-ranked outfielder in the system behind only the soon-to-graduate Robles and just ahead of De La Rosa. As a result, there won't be too much talent in his way in the upper Minors. "I think he might actually be better than what we saw at the end of the year," Scialabba said. "He had a lot of games under his belt with college and the pro side. So we think he can be a plus runner who can feature at the top of the lineup, give you a good AB. He's got some power potential, too. He's a smaller guy, but Adam Eaton is a smaller guy with some power in the big leagues. Physically, he's going to get stronger with our program. He has an advanced feel for the strike zone, leading to his ability to get on base and do damage. We're very excited about him right now."